NOTES: Basically the Hasegawa kit with conversion bits. The Ki-61 which was designed by Takeo Doi and his deputy Shin Owada, was one of two parallel designs tendered for by Kawasaki to fulfill requirements framed by the Koku Hombu late in 1939 for two fighters. Each was to be built around the Daimler-Benz DB 601Aa, a derivative of which was to be manufactured as the Ha-40 by Kawasaki at its Akashi plant. The first design, known as the Kawasaki Ki-60, was for a heavily armed specialised interceptor, which would have a high wing-loading; the second, the Ki-61 was a more lightly loaded and armed general-purpose fighter to be used mainly in an offensive, air superiority role at low to medium altitudes. Both single-seat, single-engine fighters used the same basic construction being all metal alloys with semi-monocoque fuselages and three-spar wings with alloy framed, fabric covered ailerons, elevators and rudders. Priority was given to the Ki-60 which first flew in April 1941. Design of the Ki-61 did not begin until December 1940. Although the Ki-61 was broadly similar to the Ki-60 it featured several refinements using lessons learned from the disappointing flight characteristics of the earlier design. The all metal, semi-monocoque fuselage was basically oval in cross-section, changing to a tapered, semi-triangular oval behind the cockpit, with a maximum depth of 1.35 m (4 feet 5 inches). An unusual feature of the Ki-61 was that the engine bearers were constructed as an integral part of the forward fuselage, with the cowling side panels being fixed. For servicing or replacement the top and bottom cowling panels only could be removed. A tapered rectangular supercharger air intake was located on the port-side cowling. Behind the engine bulkhead were the ammunition boxes feeding a pair of 12.7 mm caliber Ho-103 machine guns which were set in a "staggered" configuration (the port weapon slightly further forward than that to starboard) in a bay just above and behind the engine. The breeches partly projected into the cockpit, above the instrument panel. The Ho-103 was a light weapon for its caliber (around 23 kg) and fired a light shell, but this was compensated for by its rapid rate of fire. The ammunition capacity was limited, having only around 250 rounds for each weapon. A self-sealing fuel tank with a capacity of 165 l (36.2 Imp gallons) was located behind the pilot's seat. The windshield was armoured and there was a 13 mm armoured steel plate behind the pilot. The radiator and oil cooler for the liquid cooled engine were in a ventral location below the fuselage and wing trailing edge, covered by a rectangular section fairing with a large, adjustable exit flap. The evenly tapered wings had an aspect ratio of 7.2 with a gross area of 20 m² (215.28 ft²) and featured three spars; a Warren truss main spar and two auxiliary spars. The rear spar carried the split flaps and long, narrow chord ailerons, while the front spar incorporated the undercarriage pivot points. The undercarriage track was relatively wide at 4 m (13 ft 1.5 in). Each wing had partially self-sealing 190 l (42 gallon) fuel tank behind the main spar, just outboard of the fuselage. A single weapon (initially a 7.7 mm (0.303 in) Type 89 machine gun) was able to be carried in a weapons bay located behind the main spar. The first prototype of the San-shiki-Sentohki ichi gata (Type 3 Fighter, Model 1, the official IJAAF designation) first flew in December 1941. Although test pilots were enthusiastic about its self-sealing fuel tanks, upgraded armament, and good dive performance, the wing loading of 146.3 kg/m² (30 lb/ft²) at an all-up weight of 2,950 kg (6,504 lb) was viewed with scepticism by many of the senior officers of the Koku Hombu, who still believed in the light, highly manoeuvrable, lightly armed fighter epitomised by the then new Ki-43-I-Hei which had a wing loading of 92.6 kg/m² (19 lb/ft²) (even that was considered borderline). The Ki-61 was the last of the DB-601-powered fighters and it was soon overshadowed by fighters with more powerful engines. By the time it first flew in December 1941 – only one year after the Macchi's first flight and three years after the Bf 109E – the DB-601 was already underpowered compared to the new 1,500 hp inline or 2,000 hp radial engines being developed (and already nearing the mass-production stage) to power the next generation of combat aircraft: the P-47, Fw 190 and Bf 109 G. Moreover, the inline Ha-40 engine proved to be an unreliable powerplant. The DB-601 engine on which the Hien was based was designed with very critical tolerance limits, and in the Ha-40 Japanese technicians developed a lighter version (by roughly 30 kg) that required even higher tolerances. Reaching these levels proved to be a "stretch" for Japan's aviation manufacturing capabilities, which was further complicated by the variable quality of the materials, fuel, and the lubricants needed to run this sensitive, high-performance engine smoothly. The Japanese equivalent of the more powerful DB-605 engine was the Ha-140 an excessively troublesome engine, which was fitted onto the Type 3 to produce the Ki-61-II high-altitude interceptor, the subject of this kit, of which fewer than 100 were produced, before excess airframes were converted into Ki-100s, a much more successful plane than even the Japanese would have hoped, but that is another story. This is one of Fine Molds earliest products and is pretty much a conversion of the Hasegawa Ki-61 kit, so I'm only showing the new bits. Dated 1991, the quality of the moldings is anything but fine. Sure, it has engraved detailing and that detailing is really quite well done, but the surface of the fuselage and some of the other parts has a so mewhat wavy texture that will surely look pretty nasty under a coat of paint if left as it is. The only real option is to give the entire fuselage, for instance, a light sanding in hopes of smoothing things out. 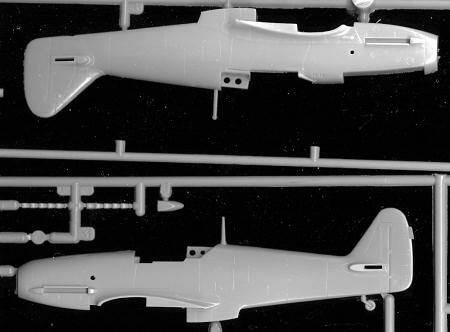 The conversion parts include a new fuselage with the different fin and cockpit area (as you can see in the comparison image to the right with the Hasegawa bits on the bottom), a new prop, upper cowling and cockpit floor. Metal parts, held in a separate inner box that is about 15 time larger than the parts held in it, consist of a new seat, control column, tail wheel, supercharger intake, spinner and main landing gear legs. 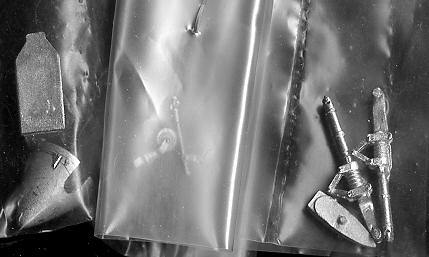 The metal parts are very nicely cast though will need the mold seam removed in some cases. A new one-piece canopy is also provided, of a quality that is inferior to that provided by Hasegawa. The instructions are just like those from Hasegawa with Gunze paint references and well drawn construction steps. There are three aircraft on the sheet. One is with the Army Flight test center in unpainted meal with green/grey control surfaces. Fine Molds has you mix this shade as well as the interior colors. The other two are from the 56th Flight regiment. One in unpainted metal and the other in another paint mixture that is a greenish brown with unpainted undersurfaces. All have leading edge ID stripes. 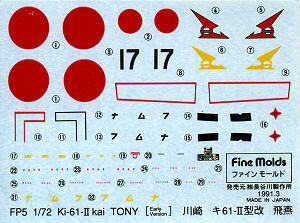 Decals are provided for all three options and are well printed, but very unlike Hasegawa decals. These are quite matte and if like those on the Ki-100 I built many years back, will work fairly well once one gets them off the backing sheet. So, is this worth getting. Well, if you want a 1/72 Ki-61-II, then you don't really have any option as the only other kits are the earlier Ha-40 powered planes provided by Hasegawa. Early Fine Molds kits were problematic when it came to fit and I expect this one to be no different. However, it will reward the builder with something a bit different from the norm. Anyway, it is worlds better than the ancient Revell 1/72 'Tony' kit I built as a youngster. Once again, you can thank me and shop credit for this baby.